Come and help us celebrate on Wednesday 28th February 2018. 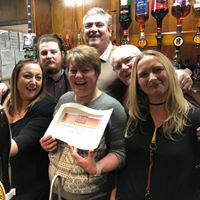 It’s the 7th Anniversary of Nigel and Sharon becoming Steward and Stewardess together with the Club’s achievement of being named the local Camra Club of the year and also the Camra Regional Club of the year and we are now down to the last four clubs in the country out of 28,000 other clubs. Can we go one further and win the title of National Club Of The Year ? The winner will be announced on the night, keep your fingers crossed. Food will also be available.